We’ve been working all weekend on this folks. 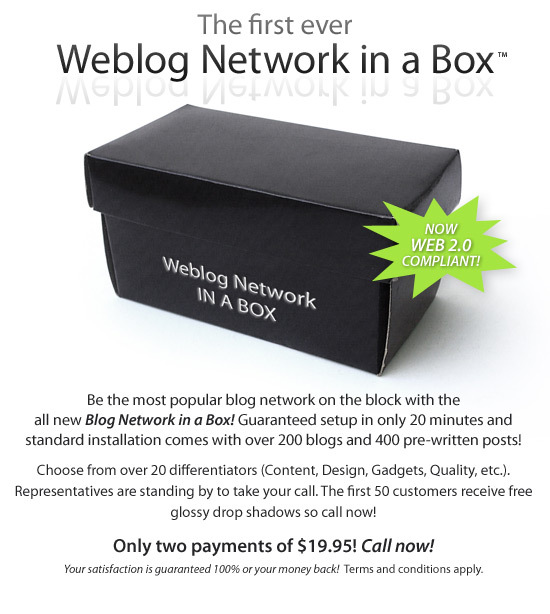 I’m really excited to introduce our newest product which will make each of you pro bloggers in 20 minutes and independently wealthy by days end. Seems pretty easy and I like the Design. If this thing really exists, I will order some! It looks very nice. I hoppe that the Box is the money worth. I order one, an then I can see it. Up in the box, everybody! Das könnten wir natürlich auch gebrauchen! I’ve been using different tools for the last ten years, but these tips were just mind bogglingly brilliant. Das haut einen glatt vom Teppich. Ha ha ha. Brilliant. I loved the little ‘web 2.0 compliant’ in the corner. That was an excellent touch. It goes to show exactly what I’ve been feeling for a long time – web 2.0 has become a majorly overused term, and some do indeed use it just to market their products and fool those who don’t know. 400 pre-written posts! Lol, that was excellent. The drop shadows was also good. Heck, this is a great parody, really well done! Nice Idea – and how much idiots actually ordered this for real?? Is this for real? Can you provide any testimonials regarding this matter? Please provide proofs and all. thanks a lot. i ll try this. Das ultimative Gadget für jeden Möchtegern-ProBlogger von Brainfuel. Vielleicht sollte ich mir, wenn es mit den Millionen dann doch nichts wird, vielleicht mal ein solches Package kaufen.